Also, 15-20 years ago, achieving 100 hp/liter in an EPA certified street car was considered an accomplishment. But with modern direct-injection technology, 100 hp/liter is child's play. GM is achieving 260 hp from its 2 liter 4 cylinder turbocharged engine. So the fact that the BMW has 3 liters, 6 cylinders, 2 turbochargers, and 'only' 300 horsepower makes it seem inefficient, like the extra displacement is wasted and the extra cylinders are merely for vibration cancellation (note that Volvo offers 300 hp from 5 cylinders 2.5 liters). This is, after all, Turbo Country, so the 6-cylinder 3.2L A4 is not even considered. The following comments pertain to the 4-cylinder turbo automatic quattro drivetrain. The technologist petro-head in me is disappointed that the higher output (277 hp) version of the new engine (in the TTS) is unavailable in the A4. So while the 2009 A4's turbocharged 4-cylinder engine has some of the benefits (roughly 25% torque gain) of the new model's direct-injection strategies, its power curve goes flat by 4300 rpm, minimizing the power gain (around 5% compared to the 2008 model's 4-cylinder turbocharged engine). Still, with 6 forward gear ratios in the transmission, and a top speed artificially limited to 130 mph anyway (even on models equipped from the factory with high speed summer tires), it seemed like the car might be worth a test drive. Maybe two. In August 2008 I drove a base model A4 for around 20 minutes with the salesman along for the ride to answer my questions. It was a damp day in a brand new car, so it was a pretty sedate drive; I got the traction control light to come on very briefly the first time I tried; it was a non-event, and I didn't try again. I'd been told that the engine's computer knows the car is still in its break-in period and so will limit engine output. The car felt somewhere between sluggish and peppy, never weak, always responsive. Not bad at all, but the engine felt more willing than eager, I'd say. At idle, the 4-cylinder vibration was dealt with pretty well. There is a spot just above idle at which the engine mount characteristics change for that purpose; with slight but careful (un)modulation of the throttle pedal it is possible to catch the system out of phase, but it's no more intrusive than a gear shift and thus likely that most passengers would never notice it. The base ("Premium") model's audio system played my CD-R of MP3s just fine. It also has a small slot (barely more than a slit) for an SD card. Assuming it handles SDHC cards, that's nothing to sneeze at, though it's still not as useful as just having a USB port that can charge portable devices and/or access a huge data storage device. At least the base audio system also has an analog audio auxilliary input jack in the console. One example of the problem of the "equipment packages" is the Drive Select option. That $3000 active-steering-and-suspension system is only available if one has also selected the most expensive "Prestige" package. And if you want the sport seat and steering wheel, that's only available as part of an optional sport package which comes with a sport suspension. If you want the Drive Select package and the sport steering wheel and driver's seat, you pay for 2 suspension upgrades but only receive 1?! Plus, for 2009, the only way to get the steering wheel paddle shifters is to order a sport package. But if you want the paddle shifters but don't want to be stuck with a firmer ride, that extra-expensive pay-for-two-and-only-get-one deal, on top of the top-of-the-model equipment package, is apparently your only recourse. As for which wheels you might prefer versus which ones come with each different equipment package, that's a whole other can of inflexible worms. In November 2008 I was at another Audi dealer, with a friend who'd bought an S6. Under those conditions, the dealer was happy to let me take a 2009 A4 for the weekend. When I was asked, "Which one? ", I said "Drive Select." They had one DS model, with a $47K sticker, so that's the one I drove. The first night my head was swimming after reading the owners manuals. So much to keep straight. Especially with so many new-fangled features and when there is more than one "reset" button. It's a nice car. I'm not sure that this is the wisest time to be buying an expensive new car that can only burn gasoline, and the '09 A4 could never do everything as well as my '95 850 does, but it's very nice, and pretty fancy in some ways. The 2-zone climate control lets each front seat have not only its own temperature but combination of air outlets. The rear camera, for backing up, takes practically no getting used to; it's great. Ditto the auto-dimming rearview mirrors. I didn't get around to trying (to enable) the auto-recirculate feature (for when stuck behind a car with dirty exhaust fumes), but it supposedly has that very handy capability. OTOH, the powered self-folding outside mirror housings is a feature that definitely seems to have been deleted from the cars after the brochures were printed. I really liked having the cockpit-adjustable suspension. I had one in my previous car, a 1988 Mazda MX-6 GT. But that car was very softly sprung and so the 3 settings did not make much difference. The A4 is well-sprung, and the 3 settings made more-noticeable changes. The middle/normal position is a fine compromise between ride and handling for a sport sedan. The stiffer position is obviously much stiffer, and unsuitable for unsmooth pavement, and overkill for normal driving. The softer position was not at all mushy in normal driving and took the edge off of bad pavement, though the difference between normal and softer modes felt like only about half the difference between normal and stiffer. (IOW, you can make it slightly softer or much stiffer than normal. IMHO that effectively means you have 2 choices for the real world, and one setting for high-performance driving on excellent pavement.) There is a 4th mode that allows the driver to specify his preference for suspension plus which combination of steering and transmission modes should accompany it. I never did decide how much and when I preferred the dynamic steering; with it enabled, the steering was a bit darty and anti-sneeze-proof on the highway at speed, so for long interstate cruises I think I'd probably want it off. In the city it seemed like a good thing, but its operation was so transparent that I was never able to feel/catch it in action, so it was not easy to discern exactly what it was accomplishing (not trying to accomplish), or when. But in the city I decided that I usually preferred the softer suspension setting. So I quickly found myself programming and selecting the user preference settings profile. I also quickly decided that I really did not like the fact that the car always reverted to the middle/normal factory default Drive Select settings profile every time the engine was started. As before, this car also had relatively few miles on it, so the engine was not up to full song yet. I gently (and easily) took it above 100 mph at about 1000' above sea level and was suitably impressed by how quiet it was (later, when I had it up on a lift, I could see all the aerodynamic attention to detail on the underside of the car -- pretty much the entire underside is enclosed in shaped plastic cladding -- which probably accounts for most of the unexpected level of hush at speed). Remember where I mentioned that the 2008 BMW 3-series lacks the little knob that lets the driver instantly control and infinitely vary the dimness of the instrument lighting? Well, the A4 has one. BUT, it's not fully implemented. In the fancier models with navigation and full-color LCD between the speedometer and tachometer, it does not control the luminance of either LCD! But wait, it gets worse: If one wades through the correct multimedia interface (Audi's I-Drive) menus, there is a screen which will permit you to control the brightness of the main/navigation LCD. (Evidently there is no way for the driver to control the brightness of the LCD right in front of her.) But wait, it gets still worse: Having turned down the brightness of the main/navigation LCD to suit the brightness of the traditional instruments display, the next morning I could see the LCD right in front of me just fine but the main/navigation LCD was not bright enough, so I had to wade through the same menus again to turn it back up! Exacerbating this debacle is the orientation of the polarization of the LCDs. They are at 45 degrees. So, wearing polarized sunglasses, unless one drives with one's head tilted 45 degrees to the left, there is much extra darkening going on (45 degrees to the right is full darkening). Haven't these automotive [display] manufacturers ever heard of polarized sunglasses? Don't they know that they can be a fast and safe driver's best friend? Having the most vital navigation information on a display right in front of the driver is a nice touch. It's good to see that, after all these years, Audi has finally found a valid reason for having so much space in the middle of the display, separating the speedometer and the tachometer. It's such a shame that its brightness cannot be controlled, and also that its liquid crystal light output is not horizontally polarized. IMHO, Audi has released an unfinished product. The steering wheel has 2 thumbwheels. The right one is for audio volume. But instead of pressing/clicking the thumbwheel to un/mute (un/pause) the audio, Audi not-so-cleverly decided to make a right thumbwheel click cause the last/previous navigation command audio to be repeated (IMHO, as someone who's driven for decades with no navigation audio commands, and thus can drive without them, and don't depend on them, I think the last nav command audio repeat feature is less important, of lower priority, and less often needed than the mute function, and therefore should be a double-click). In order to mute the sound, the driver is expected to turn the thumbwheel all the way down. The car came with satellite radio (something else I've never had before and am not accustomed to). The shop where I had the car up on a lift has a steel roof. So to unmute the sound I had to turn the thumbwheel up. But nothing happened. But I was distracted and didn't think about it. Later I turned the thumbwheel up again but still nothing happened. Later, as I was backing the car out of the shop, the satellite radio suddenly came on, at literally ear-splitting volume. More than a month later, my hearing is still slightly diminished from that highly abusive excessive exposure. NOTE TO AUDI: UNLESS YOU ENJOY HARMING/TORTURING YOUR CUSTOMERS/VICTIMS, YOU MUST NOT EVER PERMIT THE VOLUME OF A MUTED/DISABLED AUDIO SOURCE TO BE RAISED. (In my old, 20th century conveyance, pushing the volume knob pauses/mutes the audio; if the knob is turned while still muted, that input is ignored. Is Audi ignorant, incompetent, uncaring, or cruel? How many people's hearing must be assaulted before Audi exorcises this demonic damaging audio equivalent of unintended acceleration?) My home stereo's speakers' fuses blow (to protect the expensive speakers) before they play that loudly. The A4's powerful sound system needs, along with more intelligent inputs that provide feedback, some kind of hearing-protective volume limiter. It turns out that the 2009 A4's side assist feature is pretty sophisticated. When it warns its driver of a potentially unsafe signaled lane change, it does a time-speed-distance calculation on approaching/overtaking vehicles from the rear; it does not merely determine if one is present or not. To do this, it uses radar. Two transmitters; one at each corner of the rear of the car. There is one outright ergonomic error to the MMI (multimedia interface): The interface consists of a knob with 4 buttons positioned around it, corresponding to the 4 corners of the screen. These work like "shortcuts" based upon choices displayed in the corners of many menu screens. That's fine. But the "back" (or "escape" or "return") button (to disengage from whatever menu or function is currently displayed) is to the rear of the knob (at the 6 o'clock position). No hand I've ever seen has a finger there. And it's not made to be tapped with the heel of one's hand, either. It would be far better to pull rearward (or even to lift up) on the knob to indicate a desire to return to the previous menu. Worse, to either side of that important button are orphaned track-forward and track-reverse buttons for the audio system. So if you were in the middle of a great long song when your arm and hand and fingers went roaming in search of the important button, there's a chance you'll find yourself either listening to the next song or to the same one over again from the beginning. 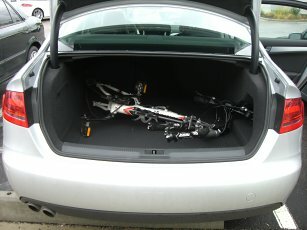 Thanks to a small but fortuitously-located recess in the right side of the trunk, it was able to fully swallow my bicycle (with wheels removed) without any intrusion into the passenger compartment. I know a car's appearance is almost entirely subjective, but I have some reservations. I'm not sure I like the lack of body side moldings (to help protect the doors from parking lot dings). I've never owned a car without a front bumper. And the '09 A4, especially with all its chrome, is not nearly as visually stealthy as my current car. Some other things just rubbed me the wrong way. The insanely-optimistic 180 mph speedometer, for one thing. Its orientation, for another (as if precisely knowing one's speed is more important on the autobahn than in a school zone). And, having since the mid 1990s driven a car which does not know what day, month, or year it is but which can tell me how many miles per gallon it's delivering, I found it peculiar to be in an upmarket (base model, "Premium") new 21st century Audi which displayed the year, month, day, and am/pm but which could not tell the driver what fuel efficiency it was returning. The one other thing which made a distinct negative impression on me was the car's side view mirrors. Well, just the one on the driver's side, actually. It so fully obscures the view through the lower forward corner of the window, by the base of the A pillar, that it's no easier to clip gradual left-hand apexes than right-hand apexes in the car. Then there are the smaller nits to pick, but presumably you can read about them (such as how far down the steering column its manual adjustment release lever is located, or how long a reach it is from the seat to an opened front door's hand grip) and other stuff (like what the car's cruising range is) from any information source. I mainly wanted to help make the world aware of the huge glaring oversights and omissions and deficiencies and defects in the 2009 Audi A4, something the professional automotive writers + publishers seem unable and/or unwilling to do.